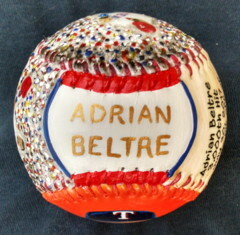 This Legends Adrian Beltre 3,000th Hit Baseball features my original paintings. 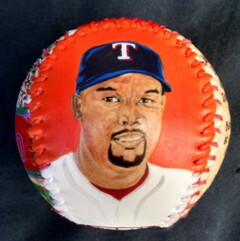 Side one is my portrait painting of Adrian Beltre. Click here for a closer look. 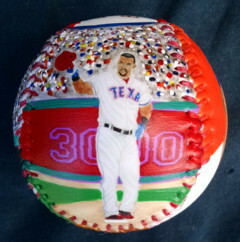 Side two has my action painting of Beltre hitting number 3000. Click here for a closer look. Side three has my painting of Adrian tipping his cap after getting his 3,000th hit. Click here for a closer look. Side four tells the story. 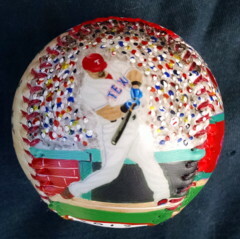 Side five, which is the top of the baseball, has "Adrian Beltre" painted in gold and trimmed with Ranger's colors. 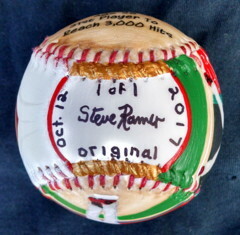 Side six, which is the bottom of the baseball, has my signature along with the date that this Legends Hand Painted Baseball was completed and trimmed with gold. Also you will see "1 of 1". This means that this is number one of only one created. This is a one of a kind piece of art. There will never be another exactly like it. 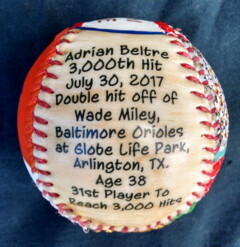 Contact Me To Purchase This Baseball or click on the Add To Cart button below to use your credit card and Pay Pal. Shipping is FREE within the Continental United States. Please add $15.00 for International Shipping when ordering (Includes Hawaii and Alaska).